I just had a shocking experience at the movies, the kind that makes you feel like you got hit by lightning. I went to see Neil Burger’s The Upside, whose plot description, about a streetwise Black man who takes care of a grumpy rich white male quadriplegic, seems just awful. However, I went because Bryan Cranston is a fascinating actor, and Kevin Hart is really funny. Both of those statements, about the horrible plot and the good acting, prove completely irrelevant to the grandiose achievements of the actual film. These critics did not see the same movie I did. Perhaps they walked into Aquaman by mistake and then suffered from a heretofore unreported nation-wide epidemic of strokes. A fine arts major from Yale, director Neil Burger made experimental music videos in the 1980s. The critics are reading his film for the plot, indeed a bundle of clichés about the ability of the “magical African-American friend” to take an emotionally-wounded white man and allow him to live again. Yet, on top of that narrative, Burger has built a shockingly clever triangulation of art history, literature, and opera. These intertextual relationships have virtually nothing to do with a plot-based criticism, and yet, as I hope to demonstrate, such aesthetic maneuvers do in fact redeem the only seemingly conventional nature of the film’s script. Meanwhile in 2012, the British review in The Independent labeled Intouchables “a third-rate buddy movie that hardly understands its own condescension… Why has the world flipped for this movie? Maybe it’s the fantasy it spins on racial/social/cultural mores, much as Driving Miss Daisy did 20-odd years ago—upright rich white employer learns to love through black employee’s life-force. That was set in the segregationist America of the 1940’s. What’s this film’s excuse?” The answer is that films are far more than vehicles for plot. I’ll leave a defense of Intouchables for another time. For now, I want to consider Burger’s transformation of the French film, both stories based on an actual friendship between white quadriplegic Philippe Pozzo di Borgo and Abdel Sellou, a Franco-Algerian man. The soundtrack of Intouchables relies on a love of African-American music, ranging from Nina Simone’s “Feeling Good” to George Benson’s “The Ghetto” to Earth, Wind, and Fire’s “September.” Such music is mashed together with traditional European classical music, such as the Vivaldi Concerto for Two Violins and Orchestra. 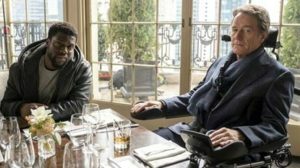 The well-known French love of African-American music is itself a cliché in Intouchables. However, when this conceit is re-adapted back into the context of the United States, Berger pulls off something absolutely transcendent. I have to leave aside The Upside’s stunning mise-en-scene, littered with artwork. Because I’ve only seen the film once, and an art historical analysis would require hours of concentrated study of the film’s dozens of artworks hanging on walls, I’ll just relay one of the film’s best jokes. To stick it to his obnoxious, racist neighbor, Cranston’s Phillip sells Dell’s ridiculous painting of a dog for $50,000, gutting the absurdity of the fine arts marketplace. Later in the film, Phillip tells Dell that his wife, who died of cancer, leaving him emotionally devastated, gave him a birthday present every year of a signed first edition of all the great works of literature. When Dell has to demand the book back from his son, having known neither the financial nor emotional value of the volume to his newfound friend, Dell’s relationship with his son seems forever doomed. The appearance of The Adventures of Huckleberry Finn in The Upside is one of the elegant ways Burger’s script re-works its seemingly clichéd plot material. The fount from which the Black and white Hollywood buddy movies spring is Twain’s story of Huck and Jim’s friendship on the Mississippi River. To take that plot back from his son, Dell exposes the story’s instability in an America which continues to destroy the Black family and push a huge population into ghettos from which even Huck’s flight is simply an impossibility. Crucially, one of the books right next to Twain on Phillip’s shelf is a “rags-to-riches” novel by Horatio Alger, the myth of American upward mobility the nation’s cruelest 21st century joke. As Was Huck Black?—Shelley Fisher Fishkin’s wonderful analysis of Twain’s novel’s racial politics—indicates, the resonance with Dell’s story is obvious, and perhaps banal. However, the film’s next literary maneuver is most definitely not. Late in the film, encouraged by Dell, Phillip has agreed to meet in person his female pen pal, to whom he has been sending epistolary love missives. When they finally meet, things seem to be going very well between Lily (played in a powerful cameo by Julianna Margulies) and Philip. She is a librarian, and tells him the story of Shel Silverstein’s beloved children’s book, The Missing Piece (1976). A round circle with a pie piece missing rolls around looking for the geometrical shape which will complete it. When the circle finally finds the perfect object, it at first happily rolls along, only to discard the piece because it now rolls too fast to be able to enjoy the company of others, such as worms and butterflies. It has always struck me that The Missing Piece is a vicious critique of stable, long-term, loving relationships: when the partners unite, Silverstein argues that the union creates less happiness, not more. The Upside proves to be a remarkable repudiation of The Missing Piece. In the middle of their seemingly pleasant first date, Lily gets panicked by a small bit of food that has spilled on Phillip’s shirt while she has been feeding him. She speaks honestly about her inability to endure Phillip’s condition. Phillip desperately tries to get out of the restaurant, crushed at the fact that Lily, like almost everyone else, is unable to look past his disability. As in Silverstein, Lily has rejected her missing piece, revealed in Burger’s script to be an act of abject cruelty. On the other hand, Dell also proves a missing piece in Phillip’s life, and this union leads to not only a lifetime of friendship, but the radical transformation of each man’s identity. The Upside is the Thelma and Louise of masculinity. Indeed, The Upside is about Phillip’s finding not one but two missing pieces, first Dell and then accepting the love of the executive tending to his estate, Yvonne (Nicole Kidman in yet another great role in an art film). The film rejects Silverstein’s false binary: to be stuck with one partner does not exclude all other encounters in life. A circle can be whole, and still spin slowly enough to stop and interact with others. The blending of the pieces of humanity that are Phillip and Dell is most compellingly expressed via the film’s presentation of opera. At first, Dell is outraged that Phillip has forced him to sit through a three hour opera, Mozart’s The Magic Flute. We see on stage the Queen of the Night deliver the famous coloratura aria, “Der Holle Rache” (“Hell’s vengeance boils in my heart”). The rage expressed in the opera slips between that of Dell as an African-American man whose family is stuck in the projects, and Phillip, whose anger at the death of his wife has caused him to find no joy in living, especially confined to a wheelchair after a hang gliding accident. Phillip’s barren life is consumed by his insistence that people follow his DNR order, medical instructions to not resuscitate him should he stop breathing. The masterful control of breath required by the soprano to deliver the aria is perverted in Phillip’s arrogant belief in the superiority of his cultural expertise: he will not let Dell listen to Aretha Franklin, a different Queen, this one of Soul. Yet Phillip’s arrogant defense of high culture is rendered moot by his desire for his body to cease respiration. The planting of The Magic Flute early in The Upside is payed off at the film’s second turning point. Yvonne and Dell have planned a surprise for Phillip’s birthday. The quadriplegic flies into a rage, having specifically instructed them not to throw a party for him. Phillip retreats to a room to hide from his friends. Dell enters and tells him to stop feeling sorry for himself. Unable to physically express his rage, Phillip screams, prompting Dell to destroy the expensive presents Phillip has received. Dell becomes Phillip’s proxy in taking out his anger on the world by destroying the room, a crazy reconstruction of Charles Foster Kane’s destruction of a room toward the end of Citizen Kane. The anger expunged, Dell wheels Phillip back into the living room where his friends are assembled. Dell demands that the soprano hired to perform at the party sing the Queen of the Night’s aria from The Magic Flute, an echo of the rage we’ve just witnessed in private, transformed through prestidigitation into a celebration of life. The aria leads to a night of both classical and popular music. When the latter plays, Dell encourages Phillip, and even the uptight Yvonne to dance, a harbinger of the romance which will end the film. I have saved the most startling operatic accomplishment of The Upside for last. While Dell is driving Phillip in the car, the rich man demands they listen to “Nessun Dorma,” the famous aria from Giacomo Puccini’s opera, Turandot (1926). Dell is disappointed that he cannot listen to his beloved Aretha instead. The resolution of this musical conflict is the key to how The Upside takes clichéd material and transforms it into something far more nuanced. “Nessun Dorma” is the Mona Lisa of opera, presented in so many movies where the soaring beauty of the tenor’s voice telegraphs to us that we are supposed to be experiencing a moment of emotional transcendence. The aria is used in a wide array of films ranging from The Mirror Has Two Faces to Bend It Like Beckham. Before The Upside, the most interesting use of the aria had been in The Witches of Eastwick. The Devil (Jack Nicholson) has a party—interesting word, “ballroom”—in which the sumptuousness of the aria is deconstructed, its opulence now serving as a critique of human lasciviousness, the work of Satan. In The Upside’s most transcendent scene, even more powerful than in the Updike adaptation, Phillip has Dell listen to Aretha Franklin singing “Nessun Dorma.” Dell cannot believe what he is hearing, but in fact, at the 40th Grammy Awards, Luciano Pavarotti’s sore throat caused him to cancel his performance at the last minute. In Turandot, Calaf wants to marry Princess Turandot, having won the right to do so by answering her riddles. When she rejects him in disgust, Calaf presents her with one more chance. In an echo of Rumpelstiltskin, Calaf agrees to call off their marriage if she can guess his name. Desperate, the princess orders everyone in the kingdom to stay awake all night to discover the answer. The curtain of Act III opens to find Calaf listening to the princess’ order reverberating around the city: “Nessun dorma” (“none shall sleep”). Calaf sings triumphantly that no one will discover his name, and that his kiss will bring about an end to the princess’ hollow life without love. Similar to reductive gender political readings of Puccini’s opera, The Upside is far from the racist exercise its critics have painted it to be. The fusing of the friendship between Phillip and Dell, as unlikely as it seems, is achieved through a gloriously subtle musicological maneuver. Phillip’s offer of a job to Dell leads to the salvaging of the African-American family; Dell’s perseverance gives Phillip a second chance at life, and a rekindling of his own love life. Dell’s Calaf melts the princess’ heart. In this case, the princess happens to be a successful businessman instead of Chinese royalty. This story, of an improbable collision between Black and white America, is deflected from the preposterous by the fact that it had already occurred in music. When Aretha Franklin took to the stage at the Grammy’s, she forged a specifically American music out of a dead European art form, rejuvenating both. When Dell takes Phillip paragliding to emotionally overcome the accident that nearly killed him, it is not just the magical African-American friend teaching the white man how to live. His friendship with Phillip has also brought him back to life, shaken out of the slumber into which poverty and racism have placed him. Both men activate the love in each other’s souls. Indeed, none sleep at the end of The Upside. Like the princess before them, Dell and Phillip awaken via the rediscovery of love. My sobs at the film’s ending give testament to the inability of the film’s spectators to sleep. If one knows how to navigate the film’s complex set of intertextual engagements—art historical, literary, and musicological—the film is intellectually and emotionally overwhelming. If only we could get the critics to wake up.